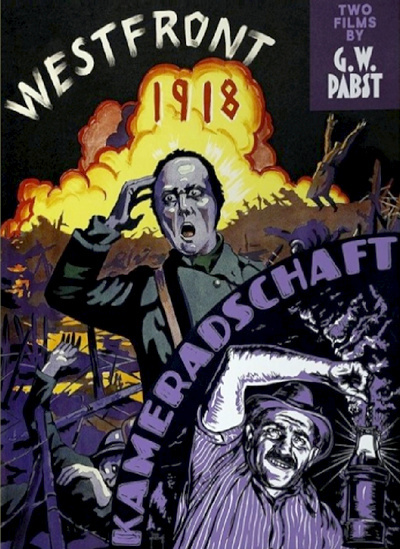 Released in the same year as the American film All Quiet on the Western Front, the German Westfront 1918 is another early example of an anti-war film tackling the horrifying events of World War I. It takes a straightforward route of simply presenting life in and out the trenches at the time, following a small handful of German infantrymen as they struggle to stay alive and sane. For them, the reasons for the war have become irrelevant. Their existence is focused only on the camaraderie they share with one another, a mutual emotional support which is all they have to fend off the terror of life at the front. The sections away from the front lines show the hardships faced by those back home as well as some brief moments of relief the soldiers enjoy. Although not a war film as such, the shadow of WWI plays an important part in the other film included in this package, Kameradschaft. It tells the tale of a mining disaster on the border between France and Germany, where both German and French rescue teams came to the assistance of French miners trapped after an explosion. The actual incident, which claimed the lives of 1,099 people, happened in 1906, but Pabst and his team of writers moved it forward to just after the WWI, so it would work as a call for peace and brotherhood between nations caught up in the conflict.